Biological - Ceramic Rings & Bioballs provide the ideal environment for beneficial bacteria FISH ONLY tanks, these need not be replaced as they house detrinifying bacteria such as nitrobacter and nitrosomis. 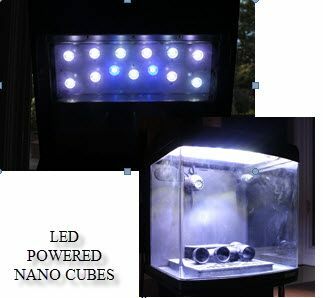 While only concealing 6 LED’s of approximately 1.3 watts each (5: 10,000k and 8: 20,000k). These high intensity These high intensity LED diodes put out three times the amount of an equivalent power compact fluorescent system) while still remaining cool to the touch. 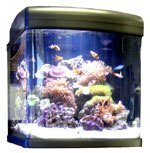 This means less evaporation, and less chance for a catastrophic salinity change if utilizing the nano cube for brackish or marine tanks. The canopy still houses built in cooling fans that draw air out of the canopy to assist in dealing with heat generated by the tanks, as well as managing moisture. The LED’s are not only more efficient but cost saving as well, utilizing an electronic ballast and a lifespan of 50,000 hours before diminishing in output compared to about 3,000 hours with a power compact system.